Progressive Retinal Atrophy (cord1 - PRA) is an inherited disease of the eye that affects the cone and rod cells that make up the dog's retina and often leading to blindness. Researchers at Animal Health Trust have identified a DNA mutation, designated cord1, that is a major risk factor for development of PRA in Miniature Longhaired Dachshunds, Miniature Smooth Haired Dachshunds and English Springer Spaniel dogs. There is currently no treatment for the disease. Cord1-PRA is inherited as an autosomal recessive trait." Responsible breeders of Miniature Dachshunds will carry out DNA testing to check their dogs Cord 1 PRA status. Breeders listed as "Assured" on the Kennel Club website offer reassurance to new owners-to be listed as an "Assured Breeder" there are both associated fees and costs as well as health check requirements. We are no longer listed as "Assured Breeders" since we believe the costs payable to the Kennel Club scheme are unecessary. We made a decision to pass on the savings we can make to our new owners while continuing to adopt the necessary principles associated with the scheme. We continue to follow all valuable guidelines, advice and breed standard information because we want to do the right thing- we have the health and well-being of our dogs and puppies at the heart of everything we do. We are experienced breeders and have., over the years, steadily built our reputation by listening to our "customers" and acting upon their feedback. We pride ourselves on the personal, high quality experience we provide. The test itself seeks to show whether a dog is Clear, Carrier or Afftected with the Cord 1 PRA mutation. If both parents of the puppy are Clear then testing is not required as the whole litter will be Hereditary Clear. Clear and Carrier dogs bred together will never be affected by the symptoms of Cord 1. Never buy a dog from a breeder who has not carried out the test. Ask to see the results certificate if you believe the breeder to be evasive or if they underplay it's significance. As a prospective owner of a Miniature Dachshund be aware that it is important to ask breeders you speak to about Cord 1 PRA and results of the puppies' parents. Only purchase a puppy if the breeder can answer your questions knowledgeably and comfortably. Make absolutely sure that at least one of the parents has tested Clear or is Hereditary Clear of the Cord 1 PRA mutation. Assume nothing- a Kennel Club listed breeder may not have followed this guidance at all. Being listed on the Kennel Club as a breeder does not equal certainty or quality. Although we are no longer 'Assured' breeders, "Croftwester" dogs are, of course all tested and the results are used to govern the mating process. There are no affected daxies in this family! 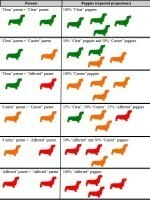 Download a full size pictorial explanation of the genetics of cord1 PRA 1 from: Dachshund Health Uk. 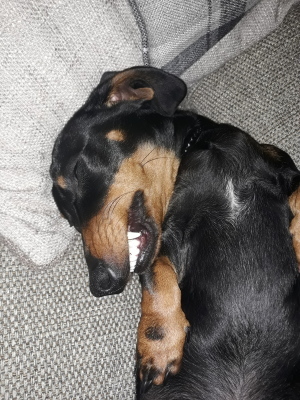 For further information please visit Dachshund IVDD Uk. On this website, you can find out more about the causes, symptoms, treatments, expense, how to reduce the risks, plus details of our IVDD screening initiative. Did you know the Dachshund is a short-legged breed, not a long-backed one? It's the genetics of short legs that pre-dispose Dachshunds to back disease. Can you prevent your dog from developing IVDD? The answer, sadly, is not always, because some dogs are predisposed either through inheritance or shape, but as a responsible owner, you can reduce the risk through the lifestyle choices you make for your dog."